Claire McCaskill, the senior U.S. Senator from Missouri has recently become mired in a sticky affair whereby allegations have been made in the news media regarding her extensive use of a chartered corporate aircraft for her air travel, some of which may have been for personal purposes, all the while billing the expense to the taxpayers. More importantly, it has been revealed that the aircraft used by the senator was registered to a Delaware corporation owned by her husband, a wealthy real estate developer whose considerable fortune came in large part from federal contracts. This would appear to be a conflict of interest of a type that politicians should always steer clear of. In March 2007, the Senator flew from St. Louis to Hannibal, Missouri to attend an annual political event and billed taxpayers $1,220.44 for the trip. The distance between these two cities is only 116 miles and could have been driven in a couple hours, incurring a mileage cost of only $112.52 at the official government reimbursement rate of 48.5 cents per mile at the time. Contrary to stories that have appeared in the media, the aircraft in question is not a twin-engine Piper, but rather a Swiss-made, single-engine turboprop Pilatus PC-12/45, a high-end pressurized executive transport plane with seats for 8 and a cockpit crew of 2. This is not an environmentally-friendly way to travel. Taking into account time for start-up, taxing to and from the active runway, runup, cruise, St. Louis approach patterns and area traffic, this round trip flight could have easily taken two hours. The PC-12/45 is not very efficient for short flights at low speeds and low altitudes and can burn 500 lbs of fuel per hour under those conditions. With Jet-A fuel weighing about 6.8 lbs per gallon, this translates into about 147 gallons for the trip. A modest sedan getting 20 mpg would have required less than 12 gallons, by comparison. The U.S. Department of Transportation estimates that 23.9 pounds of carbon dioxide are produced for every gallon of jet fuel burned, so this short jaunt was responsible for needlessly releasing approximately 3,513 pounds of carbon dioxide into the Missouri skies. Multiply this times the 89 flights said to have been flown, many of which were much longer in distance and a formidable carbon footprint starts to emerge, one that could have been avoided by using the humble automobile or a seat on a commercial carrier. There was more in store for the tireless champion for transparency and fighting government waste and excess. 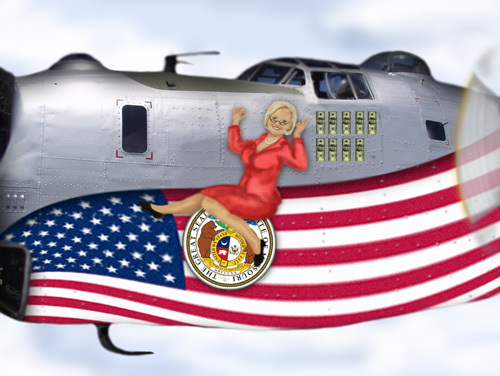 Senator McCaskill promptly reimbursed the U.S. Treasury $88,000 this month for the 89 trips on the plane, a few of which were said to be for political purposes. In recent days it came to light that the Senator failed to pay property taxes on the aircraft after it was moved to Missouri four years ago. Its market value is estimated to be in the vicinity of $2.4 million, and St. Louis County calculated the outstanding tax bill to be $319,541, including penalties and interest. Senator McCaskill’s husband’s Delaware corporation, Timesaver LLC, paid approximately $287,000 a few days ago. With her reelection campaign soon to be launched, it is all but certain that an in-depth investigation will follow in short order, with many additional lurid details emerging into the public venue. The irony in this whole affair is that during the 2004 primaries for governor, then State Auditor Claire McCaskill successfully used this same argument against her opponent, incumbent Gov. William Holden, when she accused him of using the taxpayer-funded state airplane for more than 300 trips, some of which were for the purpose of attending sporting events. Wait a minute, the Senator used to be an auditor…?